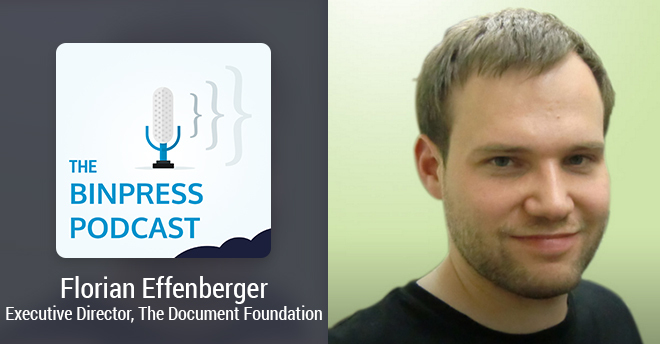 On this episode we talk with Florian Effenberger, Executive Director of The Document Foundation (TDF), the non-profit organization behind the open source office suite LibreOffice. Florian covers why open source projects need marketing, how he keeps things streamlined with mailing lists and how the TDF makes it easy for new contributors to pitch in. He also discusses the importance of localization in marketing, how to measure progress, and much more. Alexis: Thank you, Florian, for joining us on the podcast. Florian: Thank you, it’s a pleasure to be here. Alexis: Now for folks not familiar with LibreOffice or The Document Foundation, give us a brief low-down on what the two are. Florian: LibreOffice is, as the name suggests, a free – a “libre” – office suite available for a couple of platforms and a couple of languages, so fulfilling all your productivity needs. The Document Foundation is the legal entity, a German Stiftung, a foundation that backs the LibreOffice project and the LibreOffice community. Alexis: Before we get deeper into LibreOffice and The Document Foundation, tell us a bit about your background. Florian: I’ve been involved with free and open source software for, I think, it’s 12 years now – quite a while. Actually, I started in the area of free office suites 10 years ago, from a mere user to a contributor in various fields, marketing area, infrastructure area. I was one of the founders of The Document Foundation, which has been in place for two and a half years now, and these days I’m working as TDF’s executive director responsible for running projects, a lot of administrative, operative tasks, trying to oversee the running of the foundation, realizing all those projects that we want to kick off and all those improvements we want to make within the software and the community. Alexis: Did you always have an interest in marketing, or is that something you studied, or is it something that you kind of fell into? Basically that’s how it all started, and as it is with most open source projects, when you don’t say no fast enough, you get closer into – you get more roles, you get more tasks. And yeah, that’s how it happened, so totally unplanned and totally unexpected for me, but really lovely surprised and happy to be here. Alexis: Now is that – that project that you mentioned – OpenOffice at the time when you first got involved and you began staffing their booth? Florian: Yes, indeed. That was OpenOffice.org, of course. Alexis: Now there might be some confusion around OpenOffice and LibreOffice. Can you give us a bit of the history and distinction between the two? Florian: Of course. A few years ago, around 2010, most of the people of the volunteer community in-charge back then at OpenOffice.org were thinking about the plans for a foundation. It was a plan that has been flying around for quite a while, and actually then people began to talk and making concrete plans, and our goal was always to have an independent entity overseeing and backing and supporting the development and fostering the community, handling the budgets and the like, so a truly independent entity like many other projects do have. So we started that idea, and for a couple of reasons we had to find a new name, and in the end agreed to have LibreOffice as our name for the software. We started that on September 28, 2010. That was the day when we have been announcing the project, the idea to set up a foundation, and then it took us quite some time to get all those by-laws and ideas and plans in place. Finally, in February 2012, the legal entity has been created. To this day, we are a rather large open source project with lots of active contributors around the world, developing LibreOffice as the free office suite. Alexis: Now this next question might be tough for you to answer depending on when the last time you opened OpenOffice was. If I were to open up OpenOffice and LibreOffice, would I see major differences or more similarities than not? Florian: There are quite a few differences under the hood, I think, from the technological perspective; there are a lot of differences in the code. I’m no developer, so I can’t comment on the details here, but there are of course differences – what you clearly see is in the community, what’s happening, how active projects are. I think, there, you can clearly spot a difference. Alexis: Now you mentioned that you’re not a developer, which is a very interesting thing here, because developers have to do their own marketing and they have to sell themselves, which is something that they’re not always good at in terms of juggling all these – wearing all these different hats, so to speak. What are some of the marketing strategies that you use at The Document Foundation, especially ones that might be applicable to developers running their own smaller open source projects? Florian: We have quite a luxurious situation in regards that LibreOffice is a software that’s used by a broad range of end users, like the public sector, private end users, developers, so there’s rather a broad range of end users. And at the same time, this means we have a lot of broad range of possible areas of contribution. There is not just development; there is localization, there is marketing, there is infrastructure that is quite helpful to attract a lot of people, a lot of different people. We try marketing in a couple of areas, of course. First we’re marketing the software, outlining the advantages the software has, free software per se have, open document standards do have. But from the development perspective, what’s quite helpful for example is to lower the entry barrier. We have been hosting a couple of so-called “Hackfests” that were our events where developers gather and meet with experienced developers from the LibreOffice project. New contributors are welcome. At the same time we have so-called Easy Hacks. Something you can find, for example, in the wiki is a list of easily achievable tasks for someone who has some development skills but is not so much into the LibreOffice code base yet. By that, we can get them slowly into coding, into seeing how the LibreOffice project works, how the code works, how we are set up, and give them a good feeling because they can actually contribute something – a bug fix, a small feature implementation. We try to market on a couple of areas, and development is something you can easily spot that since the launch of the LibreOffice project, a lot of developers have started joining us and have contributed to the code of the software. Alexis: Now you mentioned something that most open source projects – well, all open source projects – rely on, which are contributions from the community. Most of the time, it’s technical stuff – for example, the code contributions you just mentioned. How does that apply to marketing? Do you – and if you do – how do you farm out marketing tasks to the community? Florian: We have a quite active marketing project and actually right now we’re experimenting a bit on how to improve the workflow. So far, what we classically have in open source projects are mailing lists as the main means of communication, and so do we for LibreOffice and dedicated, or even to dedicated lists for the marketing project. What we are currently looking into is some more fine-grained project management. We rely internally on Redmine, which is a free software by itself, a project management software. Just these days, the marketing project tries to organize tasks and individual projects that need to be taken care of with Redmine to improve the contributions. Another nice example are press releases. Our major releases, I think for the last six months or even more, we’ve been trying to get as many localizations as possible. If you look in our blog, I think 15 or maybe 20 languages – I’m not sure about the exact number, but a broad range of languages that at the very same time we have been issuing the press release to reach a large audience. That means beforehand we have been coordinating that internally, getting localizers to localize that, marketing contributors to distribute that to their press contacts, so we actually do a lot to get as many people involved as possible to support our marketing efforts here. Alexis: This actually touches upon one of the virtues of The Document Foundation, which is letting people create digital documents in their native tongue. I find that it’s interesting that that also applies to your marketing efforts. Florian: Of course. I mean, we are, as I said in the beginning, a rather large project and we have a broad range of users, and one of the important aspects for the software is to be developed in as many languages as possible. Those local communities have been collecting that and someone capable of speaking English and the local language was translating that and acting as a gateway, submitting that to us. Even if those people contributing individually were not able to speak English and give us that feedback, it has still made its way to TDF so we could present it and could include as many people as possible, trying to overcome language barriers as much as possible. But before we get deeper into marketing, some folks might be skeptical – why does an open source project need marketing? We’re not trying to sell anything here. Florian: I think for a couple of reasons: one is the view on the community that we would like to foster the community. Looking at it from 10,000 feet, TDF’s mission statement, vision and objective is to foster the software as well as the community. One aspect of marketing is getting volunteers and getting people excited about that, which, by the way, doesn’t only benefit LibreOffice as a software, but also free software per se – open standards, creating awareness of all of those issues and interesting points. At the same time, of course, we market the product. We market the product to make people aware of it, that there is an alternative, that you have free benefits despite the licensing costs and those topics everybody knows about. There is really the freedom behind that, that you have all those languages; that you keep the ownership of your document, so you have no vendor lock and all those aspects. I think it’s very important to convey that message, to make people aware and tell them, “Well, there is a solution where you can retain your freedoms.” It’s not just about licensing; it’s about a couple of other very important items that do affect all of us. For that reason, of course, we don’t sell anything; we don’t go to trade shows to create leads and have some sales, but we would like to spread the word. We would like to make people aware of what we’re doing and why we’re doing that. So you guys have been getting quite a lot of support from the community. How has that picked up over the years? Was it pretty fast to come online when you announced the split between OpenOffice and LibreOffice, or has it something that you’ve been gaining momentum more recently with? Florian: The situation has been improving. At the very beginning when we were talking about which legal entity to create, we decided we want to have a foundation but it was unclear in which country it would be. In the end, for a couple of reasons – mostly safety and stability – we decided to go for the German foundation, the Stiftung, but one of the drawbacks, so to speak, is that you need to have a capital stock in the bank. So you raise some interest and can finance the very, very, very basic needs of your entity by that because that’s the method of this German system. We went public and said, “We have been talking about which organizational form is best for us, which country, and we think Germany is it for a couple of reasons. But now, in order to make that happen we need funding.” We were starting a fundraising campaign with the support of the press, also that heavily-involved marketing of course. I think we called it the TDF Challenge. The challenge was, will we be able to set up this entity as we were looking forward to it? Will we have sufficient funds to pay this capital stock? We were anticipating I think three or four weeks and we were agreeing internally that after that time, if we are not close to the goal, we will look for a different organizational form and another country, some other form, whatever. It took us precisely eight days to get –. Florian: That was 50,000 donations. And the really interesting thing is that we were explaining why we wanted a specific legal entity, which is of course, as a German, you’d know it a bit better because you’ve been growing up in this legal system, but we’ve been receiving donations from all over the world. People from really all continents were trusting us that we were doing the right thing even if, for them, maybe the explanation was hard to understand as they come from a totally different legal system and they were trusting us and giving us money to set it up. So that was the first real success that we had. And then we’ve been asking on our website, the very moment that you can get LibreOffice, the moment you download, we explain the software. It’s free; you can use it freely without any obligation. Use it, spread the word, and we would be very happy if you contribute to the software, to the community, if you join us – if you actually donate time, so to speak. But of course we need some financials to make it happen, and for roughly one and a half years, there was a rather constant stream of funding that we received from our users besides the mere fact that makes TDF able to push forward projects like the Android tender that we are running at the moment, or that we have been running. The support is interesting. In 2013, we had 60,000 individual donors – that means 60,000 people from all over the world, they like the software, they trust us, they support what we do. By donating, they confirm then – besides the money, that’s a wonderful sign to see. What we do seems to be appreciated and people think we’re doing the right thing, and that’s what personally makes me quite proud to see those many individuals contributing. It’s not large donations from a few individuals, but lots of individuals donating small amounts of money and making TDF happen, I think that’s quite fascinating. Alexis: Now speaking of larger donations from fewer organizations, I figure that’s the model that the corporate sponsors follow. I’m curious on the breakdown, if you’re willing to share, how big of an impact they had when it comes to – I guess how much of a slice of the pie do they share with the individual supporters. Florian: The idea is that when you contribute to TDF, getting into TDF as a member, you cannot do by donations. Membership in TDF is tied to individuals. And then we have a so-called advisory board where we specifically gather contributors to the LibreOffice ecosystem, corporations either very experienced in free software or corporations being part of the LibreOffice ecosystem. The main idea behind that is not so much to finance TDF, but rather to exchange thoughts. We have regular phone conferences to get feedback on how is the ecosystem developing, what we do, the right approach to foster the ecosystem. The membership in that advisory board is tied to a fee that only makes a small part of the annual sum that we are able to spend. So really, the majority of donations in TDF is driven by individual donors, and of course we get supported also financially by corporate sponsors, but really, the larger part of the cake is done by individual donors. Alexis: Wow, okay. When the division between LibreOffice and OpenOffice occurred, I imagine not everybody was happy about that. Is that a good assumption? Florian: Well, it’s hard to say, maybe. What I think is important always is to see that the majority of the volunteer community went with LibreOffice and actually these days we focus a lot on what TDF does, what LibreOffice does, what is moving here – it’s always a bit tough to look into history here. So to speak, the decision wasn’t that easy; we took quite some time to handle all those things and looking at where we stand today, we are quite happy that LibreOffice has so much support and TDF is such a stable entity. Alexis: Now I ask this because in the open source world, there’s a lot of forking going on. Anybody can fork an open source project and make it their own, and a lot of times – at least in my experience with web development – you find a good project, and maybe you realize, “Oh it hasn’t been supported for a couple of months” and “Oh look! There’s this fork that has more active development and they fix a lot of bugs and they’ve added features that I’ve been looking for.” I figured that if you’re the other developer who maybe hasn’t had the time or something to – or decided to take a different approach with the software and develop it in a different way, or not at all, it’s –. I guess what I’m trying to say is it’s an interesting – I guess battle is the wrong word, but struggle, if you have a particular piece of software that you were actively developing, and there are several forks of it, and there’s all jocking for, not necessarily attention, but for the traction in the community to pull it forward. I was wondering if you had any kind of insights, even if it’s just “put your nose to the grindstone and concentrate on what you’re working on” to encourage developers or help them out if they’re competing with forks of their own software. Florian: I think every project is special by itself. You’re looking at LibreOffice and the track record and the history of it; I think quite a few projects have a very different and very special history on that. What I can say, looking back, what helped us a lot to foster LibreOffice was really being independent and being able to improve things, like what I mentioned before with those easy hacks and lowering the entry barriers for a couple of items like marketing, like development of course – that helped us a lot. I think internal advice is rather hard to give; it really depends on the size of the project and the history of the project, its age and all of those things, so I’d be hesitant to give a general advice here. But lowering entry barriers and making things really transparent and open – that’s always quite, quite helpful. Maybe if you allow a few words to talk about how TDF is organized with this membership principle, that might shed some light on that. Alexis: Yeah, absolutely. Give us the breakdown. Florian: The idea behind TDF is a so-called meritocratic approach. That means that, basically in a nutshell, everyone who contributes to fulfilling the foundation’s objectives, may it be by development, may it be localization, documentation, user support, trade show – anything that supports the foundation’s vision and its objectives – anyone who does that is eligible for being accepted as a member or formally a member of the board of trustees of TDF. You can have that role for one year and then you have to renew. Everyone who has this status, this is tied to individuals – not to corporations, but to individuals. Anyone who has this status can help with moving TDF in a certain direction, electing who’s getting elected into roles, and that encourages people that they really can make a change. They have to contribute; they should show that they are active, that they support TDF’s principles, and it doesn’t matter if they do it on a pro-bono basis or if they get paid by an employer to work on that, but anybody who contributes can become a member of TDF. This system, I think, is rather unique. We’ve been growing here; we’ve been starting with I think 100, 120 people in the former body of TDF, and these days we are at 203 people, and many of them are renewing. This is really a commitment; you have a close relation to TDF and you engage yourself. You get merit, so to speak, for doing so because you have that role as a TDF member and that helped quite a lot. Those are all things that are rather new compared to what we had before, and that helped a lot TDF to grow and really motivate and encourage people to contribute and stay. Alexis: You have a very, I guess – I’m not sure how to put it. I wouldn’t say a luxury, but maybe a luxury in the eyes of some companies that straddle both the open source and – they’re trying to do the commercial open source model. I’ve interviewed some folks where they’ve had trouble making sure that the ethos that you’ve mentioned permeates the whole organization, including the sales department, which can be kind of tricky. So you guys are doing – with all that growth – a great job of promoting that. So when it comes –. Alexis: Yeah, hey, the numbers speak for themselves. Speaking of numbers, actually, with sales, it’s pretty easy; you can count how many pieces of software you’ve sold. I know that you’re not – when we’re talking about LibreOffice, it’s all open source, which makes calculating traction and attention and growth difficult in and of itself. But especially when it comes to marketing – marketing is all about – it’s always very tough to kind of quantify the effects of your marketing. How do you measure that within LibreOffice and The Document Foundation? Florian: Indeed, it’s rather tricky for free software projects to measure that as we don’t sell licenses for obvious reasons, so there’s no sales statistics. The first thing of course is the gut feeling; you see the activity, the support. Are there a lot of things going on on the list? Are there a lot of contributions? What’s the general feeling? That’s the first thing that is rather positive for us; a lot of things are going on. There’s more going on than you can ever have a look at – that’s incredible to see that. Of course the other thing is – and we publish it regularly in our blog – the number of developers, our download statistics, are part of that. We have statistics with mailing list subscribers – we can actually measure that. Also what I mentioned before, the growth of the board of trustees of TDF members, which has nearly doubled since the creation of TDF, and if you know that you have to contribute on a regular basis to be a member, that also shows that strong commitment. So there are a couple of things we can measure; there are a couple of things harder to measure, like feedback on trade shows and general impressions, but we try to publish numbers on our blog, nice graphs, regularly to outline at least the data that we can measure. Alexis: You’ve been involved in open source through LibreOffice and OpenOffice for how long now? Florian: Those projects started 10 years ago, and I think in total, for 11 or 12 years – so over a decade. Alexis: What have you learned that you could distill into some bite-sized lessons about working with the community? Florian: What I could say personally is that the free software and engagement here for me sounds maybe a bit philosophical, but for me it really has changed major parts of my personal life. I made a lot of new friends through my engagement here; really close friends, personal friends I enjoy working with. You learn incredibly much out of that especially when working with different cultures, people from all over the world, different countries, different languages – that’s really incredible learning that by working with those people. It’s a rather special area of interest and rather a special job, I would say, but one that really is exciting to be active in. What’s of course a problem for many projects is that the communication happens most of the time on broad channels – you have mailing lists, you have phone/video conferencing; we have lots of interesting technological options here. We always say, TDF would not have been possible with the technological options like we had 15 years ago. 15 years ago, you didn’t just phone to Australia or New Zealand, wherever, for a couple of bucks. You had no real conferencing; that helped a lot. If there’s one thing I want to share is that you really should make use of meeting people in person when possible, like having a beer, having some sort of private talk, looking in their eyes, seeing how they react, really getting to know your colleagues and your community friends. That really helps a whole lot. Alexis: Okay. Now how many paid, full-time folks does The Document Foundation have? Florian: We have a few roles inside TDF. One is a Release Manager, who is responsible for pulling the blocks and then pushing the right buttons and making the official releases happen. We have, since August, a QA Engineer, who is responsible for overseeing the QA efforts, leading QA sessions, getting new contributors involved. We have someone working on a certification program that is coming up. We have someone responsible for the infrastructure. All those are very important and needed parts of the daily foundation running. We have someone who is involved in a lot of administrative tasks, working on – handling trial refunds and the like. We have the role of the Executive Director at the moment. We generally try to pay for tasks that otherwise are not dealt with, like if you look at the Android tender, what TDF invests into an Android framework for LibreOffice that has been opened for years, and we really want to make it happen, so now we are investing into that. And of course for roles where you really have time-critical things like Release Engineer. When you’re at fixed release times and when you have to meet those and really have someone wearing the hat, we try to have that in TDF. Alexis: I think this ties back into the vision of being able to have sustainable open source projects. Again, going back to that blog post that was posted a few days ago, it says, “Together with volunteers contributing their time” – oh, wait. Nope. Wrong paragraph. Did you ever think –? I guess I already answered my question by reading that. But do you ever marvel at the fact that, “Man, I have a career in open source software.” When did you first think that was possible and what led you to believe that? Florian: Actually, I only realized that when really, it happened. When we set up TDF, as the blog post said, we didn’t even dream about this constant funding and all those projects and roles we now have. All the things we really can do for the good of the community and the software – that was something we never really dreamed of. Maybe we dreamed of that, but we never thought it would happen so fast and with such an impact. Working in this area, of course, is wonderful, as you really can make your hobby into a job. You can make a living out of that. There is a saying that “Freedom comes with a price” and I think, of course, that is true. If you have such a large project, some financials are required. What we always say is the volunteered time, the enthusiasm of people, their contributions and their interest in supporting LibreOffice, TDF and the community – that’s something you just cannot express in money. That’s the most valuable asset we ever can have, without any doubts. But having some funding to be able to provide some safety, to grow, to make some projects happen of course, is very important. We’re very thankful for that, but it’s something we really didn’t have on the agenda. It hit us by surprise that we are able to do that and we are, as I’ve said, very, very thankful that we are now in the situation to really have a few things that we can move forward, that we can improve the software and that we can make it better for everyone. Alexis: Now forgive me if this is a little personal; I just like to get to the human side of the stories here. What was your career – your day job – before making this your full-time gig? Florian: I was still studying and have been working on a couple of freelance marketing projects, a couple of freelance journalist projects before. In my spare time, I contributed to TDF, and then had the wonderful opportunity to work for TDF. But before, I mainly was a student and just had a few freelance tasks I was working on before. Alexis: Okay. Now with all these years of experience under your belt, what’s one mistake you’d rather not repeat? Florian: I think what I’ve learned over the years – it’s a bit related to what I said before about meeting people. When you just have email or phone, you rather easily fall into the trap to judge people, to assume something. Like when you get a rather short reply from someone in emails you’ve sent, the impression that can be created is, “Well, he doesn’t like me; he’s rude, he’s harsh.” What I’ve learned, really, is to talk to people. For this particular case, it was a colleague who just had 30 seconds doing his day job to reply to an email. He really said – no hi, no goodbye – just wrote the core essence of what he wanted to say. I think what I’ve learned over the years is really, don’t fall into this trap to judge people too soon, especially when you’re connected virtually, but rather try to – who’s behind that, what’s their background, where are they working at, how are they, meet them, talk to them to really –. Be open. Your software is open; you should be open-minded too. I think that’s one of the lessons that I’ve learned and am happy to have learned over the past couple of years. Alexis: Learning that lesson might be the answer to this next question. It’s fine if it is, but I always have to ask it. On the flip side, what’s one decision that you’re particularly proud of, something that you’ve learned? Florian: For me, personally, when I had been asked 10 years ago, or 9 years ago, whether I want to formally join the project. It hit me by surprise. Without thinking about it, I said yes, so for me personally that was one thing I’m thankful, happy, proud of having done that. For LibreOffice, really investing time into setting up this entity, this open, transparent entity – I think that was a very wise decision. It took a lot of time, but that’s one thing – even if at the details you can always improve something, but the decision per se, I think, was a good one. Alexis: Now it’s pretty clear that the model that you all have laid out for The Document Foundation is the way you see open source projects of all colors being sustainable; what do you see are some barriers or things that people could do better to make sure that their open source projects can get to that point? Florian: We have to admit that LibreOffice, since its launch, has been in a rather comfortable situation, being widely used, a software that – as I’ve said before – has a large bandwidth of users, professional users, home users, so we have quite a large target audience. That, of course, makes it much easier to move things forward. If you have a small project but rather a special area of interest, I guess it’s much harder to make things happen. I think it’s really helpful to think where you’re at, what you like to achieve. Sometimes there are challenges like with us setting up TDF and having those statutes in place, with all those ideas and shaping that – that wasn’t quite an easy task; that was really tedious. But sometimes it’s really worth investing this time, even if it’s not the easiest road, but of course it depends a lot on what kind of projects do you have, how many volunteers are driving that. We’ve been in a quite luxurious situation here; other projects might have it much harder, of course, to get to that point. Alexis: In terms of logistics, how has managing such a large project changed and do you have any tips in terms of managing such a large contributor and a volunteer base? Florian: So what we’ve had – first, I saw it as a drawback, but then we could make a good opportunity out of that. When we started, basically we had to start with infrastructure and those processes from scratch, so we could set up all the way that we thought that made sense – that helped us a lot. Otherwise, we are gradually improving. First thing – and I think that holds true for many projects – is mailing lists, for coordination. We have one medium, one asynchronous medium, where people can read and write emails whenever they have time. Phone conferences are sometimes more productive, but if you have different time zones to cover, it’s really hard. Florian: Yeah, absolutely. And Daylight Savings, and non-Daylight Savings – when do they start? I have no idea [chuckling]. Alexis: And when do they end? Yup. Florian: So we try to limit ourselves to just a handful of tools. Not to exaggerate here, but I think email is important and either, from time to time, phone or even video conference is helpful. Sometimes you don’t need overly complicated tooling. For our internal documents we use a simple webdav. And that works, so we don’t need a complicated software with a complicated client and – I don’t know – two weeks of training to get ahead on it. Sometimes, simplicity is also helpful. Have just a couple of tools, try to get everybody in the boat; if they ever buy into the tool, then we’ll use it, and if it’s helpful for them. You grow at a speed that you can cope with – I think that’s important to really grow gradually and not exaggerate with tools and options and whatnot. Alexis: You’ve mentioned tender a few times throughout the podcast, and before we go I think we should spend a little bit more time on it just so people know that LibreOffice is coming to android [chuckles]. Alexis: Tell us a little bit about it. Florian: During the Paris conference, which took place in 2011, TDF announced we want to have LibreOffice with Android – not to replace the desktop version, but to extend it, to have another client to support the mobile area, which is simply growing whether you like it or not. But it’s growing; it’s an important market and people expect their productivity suite to be available on that. We announced that, and we were quite positive that things would happen and things would move. It turned out that it’s a bit harder to achieve, that you need a lot of knowledge, a lot of time – it’s hard to get that running. We tried various approaches; we’ve been in talks with corporations that were interested in making that a reality and in the end it didn’t turn out to be. Then a few weeks ago, the board of TDF decided, now that we have stable funding, we have a lot of donations that we should invest into making the software better, the board decided to invest into an Android version. The idea is that there is a lot of – as I understood it; I’m not a developer, so I just can give some details here – that there is a lot of framework, groundwork to build, to create, so LibreOffice on Android can run. TDF has decided to fund this first phase of LibreOffice for Android to lay out all the groundwork, all those design things like selections, showing an onscreen keyboard and hiding it when you don’t need it, layers – all those things that we funded, that we invest donations into that. Lots of donors have expressed their interest in such a version, and the rough plan is to – sometime early next year – have that done, and give that to the ecosystem, to work on that, to finally make LibreOffice on Android a reality. As TDF invests in making the software better in giving something to the user and fulfilling a request that users have been asking. That has been running until early October, and right now, the board evaluates different options and we still would expect the announcement – where we stand, what’s going to happen and within what time frame. Alexis: The journalist in me has to ask: is there any interest or plans for commissioning an iOS version? Florian: For this particular tender, Android is the target platform for a couple of reasons. We have a large user base – a large, interested user base – on Android, and from what I’ve heard, it’s a bit easier technologically. iOS is also on the agenda, but it isn’t covered by this concrete tender for the moment. But of course, we know that there is also a strong ecosystem, and if possible, we of course would like to also get into that at some point in time. Alexis: Of course, 2018, Blackberry time, if they’re still around [chuckling]. Let’s see – so is there anything that I missed that I should have asked, or something that you’d like to get across to the audience? Florian: Maybe just a date, rather largely in advance, but maybe one thing to point out already now is the next LibreOffice Conference. We have announced it a couple of days ago; it’s in September of 2015, so lots of time, but it can’t hurt to mention it already. LibreOffice Conference is the annual gathering of all LibreOffice community enthusiasts, users, developers, and it’s taking place in Denmark this year. We are in a different country every year; the conference is organized by the local community. That’s surely a date to mark in your calendar. Otherwise, there are a couple of events where you can meet us personally. FOSTEM, I think, is the next larger one where we’re at. There’s a Toulouse Hackfest coming up in November where people can meet us, so if you’d like to get in touch with the community, meet the folks behind, give us a feedback, shake hands – don’t be shy. We’re very open; we’re quite a nice community, so feel invited to join us. There’s quite an extensive list of events available at the wiki and I’m quite sure there’s also something going on nearby your town. Alexis: And since it’s in Denmark, it’s not too early to mention it because you can plan your vacation starting now and squeeze LibreOffice Conference in. Alexis: Out of curiosity, have you had a LibreOffice Conference in the US, or have you been focusing on Europe? Florian: There has not been a LibreOffice conference in the US yet. The reason is that Europe has a rather strong community for a couple of reasons; I think also a lot of historic reasons. But the QA Engineer I’ve been mentioning before is located in the US and there is, I think, in Seattle, Boston – I have to look it up, actually. There is an event coming up also in November, if I’m not mistaken, because we’re trying to grow the US community to be present there. There was some meeting in May, I think, in the US, so we tried to grow the community, to spread the word here, and I expect more events to take place there. Of course, having a LibreOffice Conference outside of Europe will be fantastic. I’d be happy to have one, be happy to be there to show how international we are and how many supporters we do have around the world. Alexis: So if folks would like to learn more about LibreOffice or The Document Foundation, where can they go? Florian: There is, I suppose, a website – libreoffice.org – where you get all the information about the software, about recent blog posts, Twitter feeds, all those social networks will be used to spread the news. I think that’s the best point of entry as all the other sources like Twitter or Google+, Facebook, the blog, wiki are linked from there – so that’s the best place to start, LibreOffice.org. While you’re there, don’t forget to get a copy of the software for you to install and have a look at what we’re doing. Maybe there’s something that you’re interested in contributing for the community; there’s also a page describing how you can get involved in that. Alexis: Yeah, you could wind up like Florian. Just, “Hey, can I help man the booth?” and then all of a sudden –. Florian: That’s a good start, I heard [chuckles]. Alexis: Yeah [chuckles]. And if we’d like to find pictures that you’re tweeting out of your hotel in Southern Germany where you’re at a conference, where can we find you? Florian: If you Google for me, there are links to a lot of feeds. I post I think to all social networks out there, so if you just look for my alias, which is floeff, then you’ll find me and you can get some nice pictures behind the scenes. Sometimes I even post pictures of sunrises out of hotel rooms. Alexis: [Chuckles] And you can find us @Binpress and myself @alexissantos. Again, thanks Florian for taking time out of your busy schedule to join us here over Skypeland for about an hour. Florian: Thanks a lot. It was a pleasure to be there. Alexis: Likewise! And for the listeners, we’ll catch you next week.